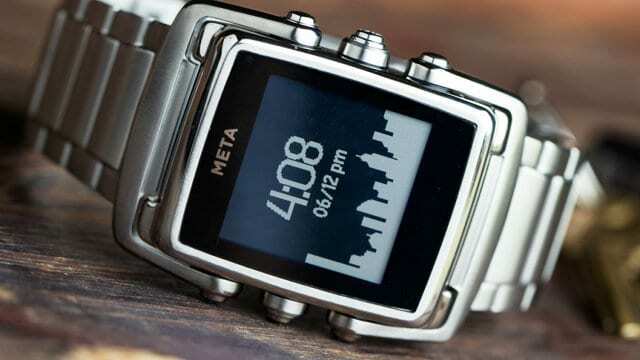 Meta Watch Steals the Show - Smartwatch This! The smartwatch has become the must-have gadget of 2014, and with so many new models flooding the market – and exciting soon to be seen versions from Apple and others – the choice is a difficult one. There is one area in which smartwatches have differed greatly from their traditional cousins, and it’s that of design. While a great watch is a thing of beauty, it has to be said that the vast majority of smartwatches have targeted function over style. Finally, we have seen one that focuses on both, and it’s a very attractive design indeed. The Meta Watch M1 is a classy, beautiful and very capable smartwatch that retails for a sensible price. Designed with traditional wristwatch style in mind, the Meta M1 is quite delectable, and comes in a range of finishes and colors. Everything from neat stainless steel to, with the premium version the M1 Limited, a choice of black or rose gold plated casings can be specified, and it really does look the part with a rectangular face that is nowhere near as brash as some of its contemporaries. A choice of steel or leather straps is also offered, again in a variety of colors. So, we finally have a smartwatch that looks the part, but does it do the business? The answer is unquestionably yes. Fully customizable in terms of how the display reads, there is no fancy color for users, just a simple to read monochrome screen with stylish font and graphics. The M1 can access a range of both iOS and Android apps and, while not equipped with some of the more advanced features of models from Google or Sony, for example, it is a very neat and able smartwatch that does the job while also looking the part. Meta Watch has, with the M1, taken a different route than the many others on the market. By offering a smartwatch that, while not as clever as some of its rivals, is so good looking it will easily steal a corner of the market. After all, watch wearers like their timepiece to look good, and this really is a very classy design indeed. Those who want full functionality – a true computer on the wrist, so to say – may be advised to wait and see what Apple’s iWatch has to offer, but if the 21st truly classy wristwatch appeals, the Meta M1 may just be for you.